WVU's Bureau of Business and Economics Research director John Deskins said that state cuts to programs that Medicaid funds will take money out of the state's economy. Cutting Medicaid in West Virginia would have substantial economic impact on the state’s economy, according to a study released today by the Bureau of Business and Economic Research in West Virginia University’s College of Business and Economics. The research was funded by the West Virginia Health Care Association, the West Virginia Hospital Association and the West Virginia Behavioral Healthcare Providers Association. Nearly 30 percent of state residents are enrolled in the program. In 2017, the study said, Medicaid accounted for nearly $3.7 billion in the state’s economy directly. Deskins said the goal of the study was to look at the economic impact of Medicaid in West Virginia and determine what ripple effects, if any, such cuts would create. 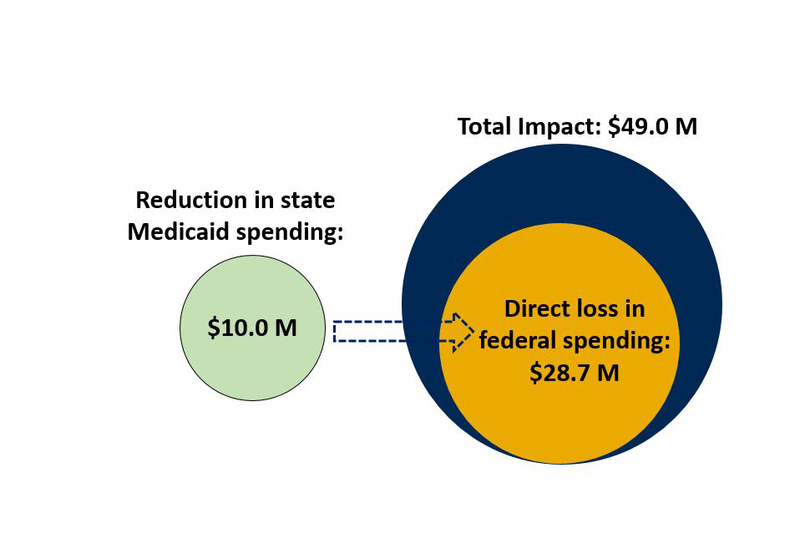 Economists looked at a hypothetical $10 million cut to Medicaid in West Virginia, and the result was a reduction of $49 million in overall annual economic output. The study noted that the impact does not stop there, as the multiplier effect of the cuts would result in a total economic impact loss of approximately $49 million, including a loss of an estimated 520 jobs annually. Patrick Kelly, CEO of the West Virginia Health Care Association, said the impact of Medicaid in the state is undeniable. The $2.90 the federal government provides for every $1 spent by West Virginia state government on Medicaid is near the top of the scale for matching funds. “Since West Virginia ranks near the bottom of states in terms of per capita personal income, the federal share for the Medicaid program in West Virginia is among the highest in the nation,” the study read. The study may be viewed by visiting business.wvu.edu/centers/bureau-of-business-and-economic-research. © 2019 West Virginia University. WVU is an EEO/Affirmative Action employer — Minority/Female/Disability/Veteran. Last updated on February 26, 2018.